Acontia bilimeki Felder and Rogenhofer, 1874, Reise Oesterreischischen Fregatte Novara um die Erde, Zoology, 2(2):pl. 108, fig. 29. Acontia disconnecta Smith, 1903, Trans. Amer. Ent. Soc., 29:212. Tarache bilimeci Hampson, 1910, Catalogue of the Lepidoptera Phalaenae in the British Museum, 10:731. NOTE - An unjustified emendation of Acontia bilimeki Felder and Rogenhofer 1874. Diagnosis: Forewing elongate. 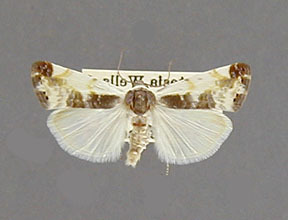 Costal half of forewing white with only two weak, yellow bands on the costa representing the antemedial and postmedial lines. 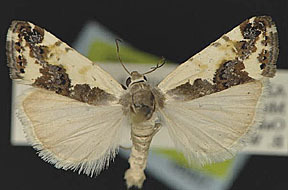 Lower half of the forewing from the base to the postmedial line dark brown with a dorsal, triangular indentation at the position of the medial line. Apex brown with a central dark spot. Most of the subterminal area is white with a central, vertical gray band. 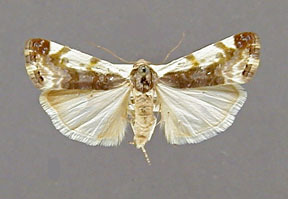 Hindwing white with a slightly yellowish-brown tint. 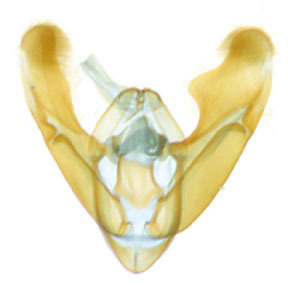 The male genitalia are distinctive with the apices of the valve rounded and capitate and with a strong rounded projection on the costal margin of the right valve (in the orientation of the picture). Wing expanse from base to apex in one selected individual 11 mm. 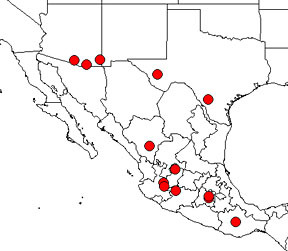 Distribution: (Based only on specimens in the USNM). Tarache bilimeki is a Mexican species reaching the southern United States. 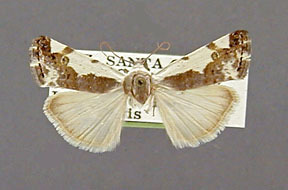 The species has been collected in southeastern New Mexico and southwestern and south-central Texas. The species appears to occur throughout most of Mexico. There are a number of species Tarache bilimeki could be confused with. Tarache huachuca lacks strong costal markings as does bilimeki. However the brown band around the forewing postmedial line is stronger in huachuca and has a strong scattering of bluish scales from the inner margin to the costa. These blue scales are absent in bilimeki. Also the suberminal region of bilimeki has a gray band. This gray band is missing is huachuca. The costal markings of bilimeki, if even present, are weak and yellowish. 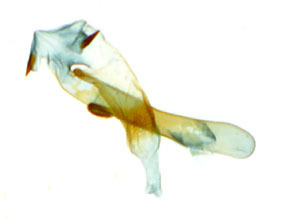 The three species Tarache new species 2, T. lanceolata, and T. axendra have strong markings at least at the inception of the postmedial line on the costa. The costal markings of lanceolata are yellowish, but much stronger than in bilimeki. In addition the overall coloration of bilimeki is tinted with yellow, not white as in lanceolata.